Built on the grand scale of America’s great western lodges, The Lodge at Red River Ranch elegantly blends the rich history of the west with the grace and charm of a bygone era and the modern conveniences of today. Offering luxurious accommodations, upscale amenities, deluxe guest services and gracious hospitality, The Lodge at Red River Ranch promises a quintessential and unforgettable retreat. The lodge features 15 well-appointed guestrooms individually decorated and furnished with period antiques and authentic artifacts, original western artworks, en-suite bathrooms and step-out balconies or patios with breathtaking views. 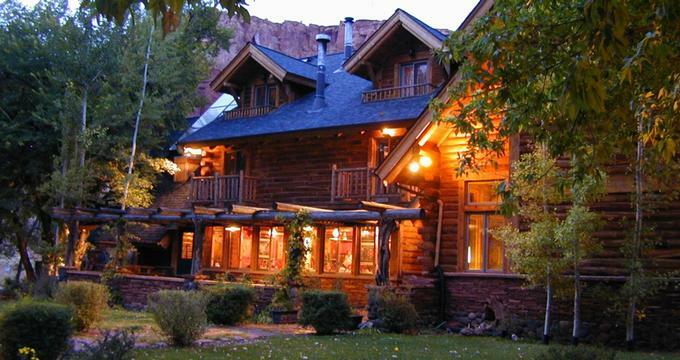 The Lodge at Red River Ranch is ideally situated for exploring the surrounding region, being a few minutes’ drive from Capitol Reef National Park and within proximity of nearby spectacular outdoor adventure playgrounds such as Lake Powell, Goblin Valley, Canyonlands, and the Escalante-Grand Staircase. The Lodge at Red River Ranch features nine guest rooms and six luxury suites, each of which are beautifully appointed and individually decorated and furnished with period antiques and authentic artifacts, original western artworks. All accommodations have plush king or queen-size beds with pillow-top mattresses, high-quality linens, 100% cotton sheets, and comforters and plush pillows, and en-suite bathrooms with shower/bath combinations, fresh towels, bathrobes, and branded toiletries. Sitting areas have comfy armchairs and working fireplaces, and modern amenities include air-conditioning, flat-screen televisions with cable channels, coffee makers, hairdryers, and complimentary wireless Internet. Guest rooms and suites have patios or step-out balconies with breathtaking views. Capturing the spirit of the Southwest on the first floor of the lodge, Anasazi is decorated with authentic Native American artistry and offers spectacular views of the red cliffs and gardens. Located on the first floor, Chaparral celebrates the heart of the western pioneer homestead with handcrafted furnishings and features a queen-size bed dressed in high-quality linens, 100% cotton sheets, and comforters and plush pillows. An en-suite bathroom has a shower/bath combination, fresh towels, bathrobes, and branded toiletries and a private patio boasts beautiful views of the cliffs and gardens. Saratoga exudes the ambiance of Old World hunting lodges and the richness of field and forest with a king-size bed dressed in high-quality linens, 100% cotton sheets, and comforters and plush pillows, and en-suite bathroom with a shower/bath combination, fresh towels, bathrobes, and branded toiletries. A private patio boasts beautiful views of the cliffs and gardens. Boasting red barn furnishings, authentic western décor, and cowboy accents, Rodeo a first-floor deluxe room with a queen-size bed dressed in high-quality linens, 100% cotton sheets, and comforters and plush pillows. An en-suite bathroom has a shower/bath combination, fresh towels, bathrobes, and branded toiletries and a private patio boasts beautiful views of the cliffs and gardens. Located on the second floor, Autumn is decorated in a palette of pastel of hues, antique furnishings, a queen-size bed dressed in high-quality linens, 100% cotton sheets, and comforters and plush pillows and an en-suite bathroom with a shower/bath combination, fresh towels, bathrobes, and branded toiletries. This room has a walkout balcony with stunning views of the orchards. Other guest rooms include Vintage, Arbor, Cornflower, and Willow, all of which are uniquely decorated and boast king or queen-size beds with pillow-top mattresses, high-quality linens, 100% cotton sheets, and comforters and plush pillows. En-suite bathrooms have shower/bath combinations, fresh towels, bathrobes, and branded toiletries and walk-out balconies have spectacular views of the gardens and orchards. Luxury suites include Provence, Cimarron, Marco Polo, Safari, Tyrolean, and Wildflower. Suites are beautifully appointed and decorated in soft hues with various styles of décor and antique furnishings, king, queen or twin beds with pillow-top mattresses, high-quality linens, 100% cotton sheets, and comforters and plush pillows. En-suite bathrooms have shower/bath combinations, fresh towels, bathrobes, and branded toiletries and walk-out balconies have spectacular views of the gardens, orchards, and red view cliffs. Cliffstone, the Lodge’s gourmet restaurant serves a complimentary breakfast every morning on the patio and includes freshly baked bread and pastries, seasonal fruit, cereals and yogurt, a variety of signature dishes, and freshly brewed coffee, tea, and juices. The restaurant also serves delicious lunch and dinner options, available upon request, as well as packed lunches and catered dinners which can be arranged. Amenities and guest services at The Lodge at Red River Ranch include an on-site restaurant that serves breakfast, lunch and dinner, packed lunches and catered dinner parties, a games room with a big-screen television, table-tennis and Foosball table, a library nook of the second floor and an outdoor hot tub. The property has over 2,000 acres of pristine landscapes to explore and a variety of activities and adventures to enjoy, including hiking, mountain biking, and bird-watching. A complimentary shuttle is available from the Wayne Wonderland airport to the property. The Lodge at Red River Ranch offers a beautiful setting for weddings, receptions and special celebrations with a gorgeous tree-lined setting and dramatic red rock scenery. In addition to luxury accommodations, upscale amenities and gracious hospitality, the lodge offers exceptional services such as catering and dining facilities, décor and venue set-up and audiovisual equipment.